Mech Mocha, an India-focused, Bangalore-based gaming start-up, today announced its partnership with Australian game developer Halfbrick Studios, the creator of global blockbusters like Fruit Ninja and Jetpack Joyride. 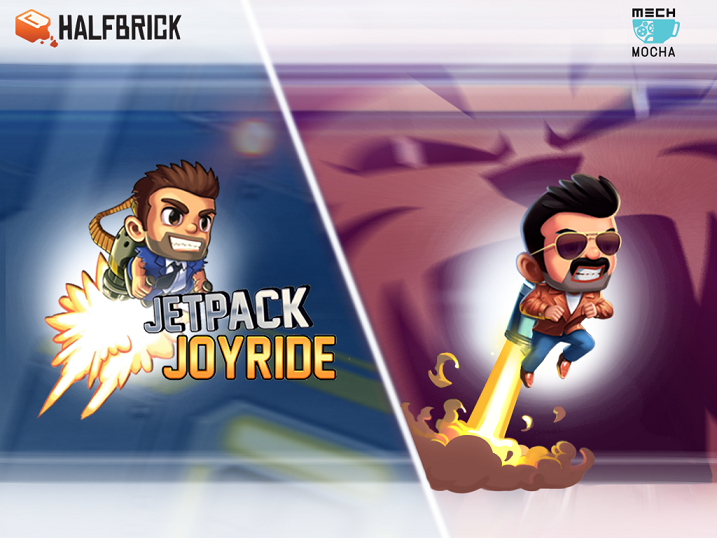 The partnership gives Mech Mocha exclusive rights to launch Jetpack Joyride in the Indian market. Mech Mocha will leverage its Indian market insights and in-house technology platform to culturalise narratives and customize the gameplay. The Indian version will star an Indian don, “Barrykanth”, who owns state-of-the-art gadgets and races bikes, cars and trucks. Mech Mocha expects 5 million downloads in the first year of launch. Jetpack Joyride will be the first international gaming title that Mech Mocha will launch in the Indian market. “Jetpack Joyride is globally recognized for its addictive controls and gameplay. We are giving it an Indian twist by culturalising the game and keeping in mind what Indians love and want to see in their games. We specialize in developing games for the Indian market and are confident that this game will be successful. We will announce the launch date soon,” said Arpita Kapoor, CEO and Co-founder, Mech Mocha. “Halfbrick and Mech Mocha had a very clear vision going into this partnership. We wanted to make a game that connects to more than 500 million future Indian gamers. I can’t wait to see the Indian version of Barry storming through the villain’s den,” said Shainiel Deo, CEO, Halfbrick Studios. Halfbrick Studios is one of the largest mobile game developers in the world with a hit library of titles that includes Dan the Man and Monster Dash, not to mention Fruit Ninja and Jetpack Joyride. The company has over two million active players each day, and more than one billion total downloads across its portfolio. The original Jetpack Joyride stars Barry, a struggling gramophone salesman, who breaks into a secret laboratory and commandeers experimental jetpacks. Besides having a different backstory, the Indian version will replace the ‘endless runner’ format of the original game with a level-based system to provide an exciting new experience for Indian gamers. It will also feature a wide range of vehicles that are highly within Indian popular culture. In the near future, the Indian version will replace the global version on the Indian app stores. The game will be free to download and players can then acquire additional content via in-app purchase. Mech Mocha focuses on developing and launching new mobile titles across the casual and mid-core gaming space for an Indian audience. Mech Mocha’s first game, Chhota Bheem Himalayan Game, frequently reaches the #1 rank on Google Play. With the game being played by over 4 million Indians, the startup has a proven track record of thinking local but executing at global standards. Mech Mocha continues to heavily invest in an integrated technology platform with cutting-edge capabilities in behavioural analytics, multiplayer, LiveOps and monetisation. Founded by IIIT Gwalior graduates Arpita Kapoor, Mohit Rangaraju and Shilp Gupta, Mech Mocha focuses on creating high-quality mobile games for the millions of Indians coming online due to the smartphone revolution. Their first game, Chhota Bheem Himalayan Game, is loved by a community of over 4 million players in India and has frequently reached the No. 1 rank on Google Play. Mech Mocha now has a team of 30+ highly talented artists and engineers who have previously worked on highly regarded games and movies at EA, Zynga, Disney and DreamWorks. Last year, Aditya Jalan – ex-AVP, Product at Myntra and Zomato – joined the team to lead product development. Gravitale is Back with its New Vinotherapy Products, Exclusively on Purplle!